The first GMSF Consultation ended 16 January 2017. 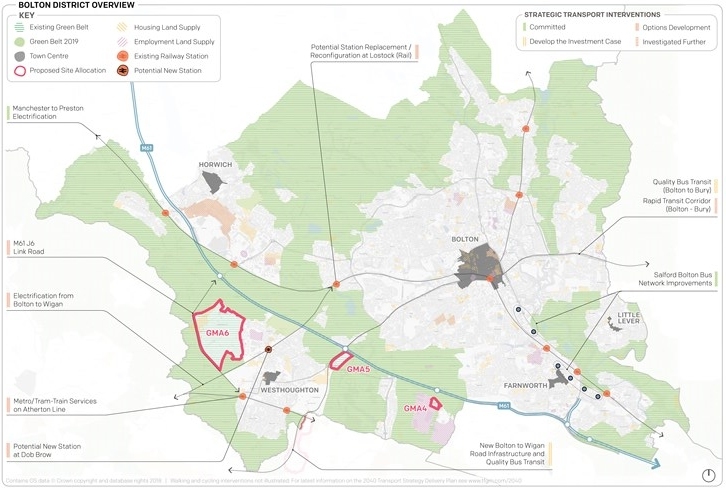 Westhoughton had a significant number of proposed development sites as the new, autonomous Greater Manchester body submitted its initial planning strategy. Areas for possible development included all Westhoughton Protection Open Land sites as well as Green Belt land at Hulton Park. The latest GMSF v2 has been released (January 2019). Details. The controversial plan has been redrafted with more emphasis on brownfield development and less on green belt development. An 8-week consultation ended 18th March; we await its outcome. Information can be found here >> Documents | Overview | Consultation | GM Mapping. Summary of Planning Matters given in note from Bolton Council Planning Department read out at Westhoughton with Chew Moor Area Forum 23 March 2017 Planning Notes (GMSF, Hulton Park, Lee Hall, Bowlands Hey). Though outside of Bolton Council's Local Plan (2011-25) and Allocated Sites provision, a planning application was submitted for 300 dwellings on this area of 'Protected Open Land' in 2015. A potential development that could open up the whole area, putting considerable strain on infrastructure and services. The application met with strong opposition from local residents and councillors of all parties. Unanimously refused at Planning Committee stage that December, the developer appealed and a Public Enquiry, overseen by the Planning Inspector, eventually took place 26-29th June 2017, the judgement delivered 19 December - the Inspector has now approved this development on Lee Hall deeming that the need for housing is greater than the impact on infrastructure. Application | Appeal | Enquiry | Decision. Since the original application, the Greater Manchester Spatial Framework (GMSF) emerged and allocated Lee Hall/Hulton Park for 2,700 dwellings (up to 2035), with a road linking Gibfield to Chequerbent roundabout. In 2017 Bolton Council put forward a proposal for a 'bypass' through Lee Hall to link Gibfield to Chequerbent/Snydale Way (Cabinet Report). In reality this proposal was to release the development potential of the area, as such only delaying this development whilst a suitable road and Chequerbent modifications were put in place. It is a decision that will disappoint many who live in and commute from Westhoughton. It is a sad day for S.W.A.N., and for those involved over the years since 1998 trying to ensure planning issues were dealt with some appreciation of the issues facing Westhoughton, and of its independent geographic setting. Planning application (97377/16) for 129 homes on Protected Open Land on west side of Westhoughton before Planning Committee in 12 January 2017. Controversial marketing leaflets had previously been circulated; local opposition. In light of Bolton building shortfall and Hill Lane Public Enquiry decision regarding 'safeguarded land', Planning Officer did recommend approval (Report); financial contributions to Council not insignificant. Planning Committee decision - application rejected. Developer has appealed decision, and a Public Enquiry was held 5-7 July. The decision made to approve this development (21/8/17). A further planning application for 174 dwellings on Bowlands Hey has since come forward (02781/18 [29/1/18]). Refused at Council level, this was appealed and has since been refused by the Planning Inspector (9/4/19) citing harmful impact on site and surroundings, and it running contrary to aims to protect 'urban fringe'. Note: the revised GMSF (2019) removes Bowlands Hey from its allocated sites. Following consultation events for local residents, an outline planning application was submitted (22/5/17) to develop 1000 acre Hulton Park Estate - mix of leisure facilities including golf course and hotel, with up to 1,036 homes on the site. Planning Application 00997/17. A new group HEART has been set up to fight this development on green belt land. Consultation deadline has passed (27/7/17). The Planning Officer's Planning Inspector Reportreport recommending approval. Planning Committee narrowly approves the development 8-7 (22/3/18). Following a campaign by HEART and local politicians, this approved application has been 'called in' with a Public Enquiry set for 1st October 2019. Taken with proposals to develop Lee Hall (initial 300-dwelling development now successfully appealed), there is intent to build up to 2,700 houses (BN 7/9/16) in total at Lee Hall/Hulton Park as per the draft GMSF plan. Westhoughton once again appears to be bearing the brunt of development in Bolton. Note: the revised GMSF (2019) removes Lee Hall and Hulton Park from its allocated sites. The Section 106 Agreement signed, this scheme to build 106 houses on land off Bolton Road can now go ahead. Narrowly passed by Bolton Council Planning Committee in August 2016. There were a number of post-approval matters to conclude before any building work could take place. (Bolton News 7/5/16). The land was an allocated site on the Bolton Council Local Plan (originally 178 dwellings) so, in spite of local objections, was unlikely not to given the go-ahead - with any Appeal likely to favour the developer. Local issues raised concerned congestion, loss of open space and potential impact on a nearby nature reserve. The Perseverance Mill (Armor Holdings Factory) site across the road - an allocated brownfield site for 104 dwellings - is now the subject of a planning application for 38 dwellings (December 2017) - Planning Application (02326/17). Approved. For latest applications: consult Weekly List (Search: Parish - Westhoughton Town Council). Work is under way (groundworks) for approved 21-dwelling development at former Corporation Depot site on Park Road (15/5/17) (00940/17). Bolton News (BN 6/6/17). Outline Planning Application re-submitted for 58 dwellings at Hartleys Farm (26/2/18) (03000/18. This was initially refused as 00579/17 (28/3/17). Bolton News (BN 13/4/17). Approved new Aldi supermarket (Bolton Road) - with new, relocated public car park - access via Library Street. The new store opened 21st February; both car parks now available (store's is time-limited). Housing and Planning Bill (2016) received Royal Assent 12th May. Now law. Far-reaching Bill aims to boost house-building and speed up planning process. Key Points Summary (Planning Resource). In a move aimed at stimulating building, Government could buy developers' unsold homes using new £2bn fund. Part of £5bn boost, aiming to provide 15,000 new homes on public land by 2020 £2b to buy up unsold properties (Guardian 6/10/16).